We measured fluid transport properties at an effective pressure of 40 MPa in core samples of sediments and fault rocks collected by the Integrated Ocean Drilling Program (IODP) NanTroSEIZE drilling project Expedition 316 from the megasplay fault system (site C0004) and the frontal thrust (site C0007) in the Nankai subduction zone. Permeability decreased with effective pressure as a power law function. Permeability values in the fault zones were 8 × 10−18 m2 at site C0004 and 9 × 10−18 m2 at site C0007. Stratigraphic variation in transport properties suggests that the megasplay fault zone may act as a barrier to fluid flow, but the frontal thrust fault zone might not. Depth variation in permeability at site C0007 is probably controlled by the mechanical compaction of sediment. Hydraulic diffusivity at shallow depths was approximately 1 × 10−6 m2 s−1 in both fault zones, which is small enough to lead to pore pressure generation that can cause dynamic fault weakening. However, absence of a very low permeable zone, which may have formed in the Japan Trench subduction zone, might prevent facilitation of huge shallow slips during Nankai subduction zone earthquakes. Porosity tests under dry conditions might have overestimated the porosity. One of the main objectives of the NanTroSEIZE drilling project of the Integrated Ocean Drilling Program (IODP) Expedition 316 was to analyze core samples of active fault zones to investigate dynamic fault processes. There are two potentially active faults at the Nankai margin, the megasplay fault and the frontal thrust (Figure 1). Seismic waveform inversion and numerical analysis results suggest that the megasplay branching fault might have ruptured during the 1944 Tonankai M8.2 tsunamigenic earthquake (Park et al. 2002; Kame et al. 2003; Kikuchi et al. 2003; Park and Kodaira 2012). Locations of C0004 and C0007 NanTroSEIZE drilling sites and interpretation of the structure of the Nankai subduction zone. The seismic reflection section is after Park et al. (2002). Fluid transport properties of fault zones in the Nankai accretionary prism control static hydrologic behavior in the fault zone as well as dynamic fault processes. Historical pore pressure evolution at a depth in the accretionary prism is related to sediment consolidation and deformation. In addition, pore pressure distribution in fault zones influences fault strength, and a continuous increase in pore pressure can trigger dynamic slip motion (Sibson 1992). When a fault zone is impermeable, a sudden pore pressure rise due to frictional heating or shear compaction during a seismic slip increases fault instability (Lachenbruch 1980; Andrews 2002) and promotes large displacement (Tanikawa and Shimamoto 2009). A low permeable fault zone is also related to the generation of highly pressurized fluid in the megathrust induced by dehydration and fluid influx from oceanic crust (Yoshida and Kato 2011; Kimura et al. 2012; Mitsui et al. 2012). Fluid transport properties in a fault zone also play an important role in the generation of slow-slip events and low-frequency earthquakes (Suzuki and Yamashita 2009), which have been observed in the Nankai accretionary prism (Ito and Obara 2006). The key parameter characterizing fluid flow and transport in media with high porosity is hydraulic diffusivity, which is determined from permeability and specific storage measurements. Permeability of sediments and fault rocks is often reported in the literature, but specific storage data are seldom reported. In this study, we measured permeability and specific storage under 40 MPa of confining pressure and less than 1 MPa of pore pressure in core samples from sites C0004 (holes C0004C and C0004D) and C0007 (holes C0007C and C0007D) drilled by IODP Expedition 316. We then estimated the horizontal depth distribution of fluid transport properties in two fault zones in the Nankai accretionary prism. In our laboratory tests, we used core materials from sites C0004 and C0007 (Figure 1) drilled by IODP Expedition 316. Hole C0004D transects the shallow megasplay fault zone, and a major fault zone was identified in this hole at 256 to 315 m depth below the seafloor (mbsf) within Unit III (Figure 2). The fault zone consists of fractured and brecciated mudstone and volcanic ash (Ujiie et al. 2008), and 10-mm-thick shear zones are locally developed in the unit. A large age reversal is found at 307.52 mbsf, which is the boundary between the middle Pliocene Unit III and early Pleistocene Unit IV. In hole C0007D, which penetrates the frontal thrust at the seaward edge of the accretionary wedge, three major fault zones were identified at 237.5 to 259.3, 341.5 to 362.3, and 398.5 to 446.0 mbsf (Kimura et al. 2008). The latter two fault zones (fault zones 2 and 3 in Figure 2) are located near lithological boundaries. Fault zone 3 is composed of fractured hemipelagic mudstone and ash, fault breccia, and foliated fault gouge. A dark, fine-grained, 2-mm-thick slip layer observed in core section C0007D-29R-2 (438.28 to 438.57 m) in fault zone 3 is indicative of high-velocity slip localization during an earthquake (Yamaguchi et al. 2009). Depth distribution of transport properties at (a-d) site C0004 and (e-h) site C0007. (a), (e) Permeability; (b), (f) specific storage; (c), (g) hydraulic diffusivity; and (d), (h) porosity. Red lines in (d) and (h) are consolidation curves applied in Equation 4 to estimate the relationship between effective pressure and depth. We cut cylindrical core samples 20 or 25 mm in diameter and 6 to 13 mm in length for the laboratory experiments. However, the amount of available core material limited the size of the samples, and it was difficult to make specimens with the preferred cylindrical shape from fragile rock samples. Therefore, we cut several samples into cuboids with square upper and lower faces, each about 14 to 16 mm × 14 to 16 mm, and rectangular side faces 7 to 15 mm long. Most of the core materials from site C0007 are cuboid shaped (Table 1). Matrix volumes and grain densities of the test specimens were measured with a commercial pycnometer (Penta pycnometer, Quantachrome Instruments, Boynton Beach, FL, USA) under atmospheric pressure. Grain densities (Table 1) ranged from 2.6 to 2.71 g cm−3. Grain matrix volume data were used for the porosity measurements under high confining pressure. Locations and transport properties were determined by laboratory tests, which were described as functions of effective pressure. Pe is the effective pressure (Pa), k is the permeability (m2), and Ф is the porosity (no units). Equations in the list were evaluated from compression data. where Q is the volume of fluid measured per unit time, k w is the water permeability, A is the cross-sectional area of the sample, η is the dynamic viscosity of water, L is the sample length, and Pup and Pdown are pore fluid pressures at the upstream (the bottom of the specimen) and downstream ends (top) of the specimen, respectively. We used a pressure regulator to keep Pup constant (0.20 to 1.2 MPa in absolute pressure). The rate of water outflow per unit time from the downstream end of the samples was measured with a digital balance. We assumed a constant value of 0.1 MPa for Pdown because the water flowing out of the lower end of the specimen was released to atmospheric pressure. where Vp is the pore volume, Pc is the confining pressure, and P is the pore pressure. Our experimental conditions mostly satisfied the conditions for which Equation 3 is valid because the pore pressure change was very small compared to the confining pressure change. Therefore, to determine specific storage, we calculated the drained pore compressibility with Equation 3 using the results of the porosity measurements (Wibberley and Shimamoto 2005). Fluid compressibility in Equation 2 was assumed to be constant at 4.3 × 10−10 Pa−1 (Fine and Millero 1973). Permeability and porosity were measured at each step as confining pressure was increased in steps from 1 to 40 MPa, and the duration before starting the permeability tests after changing the confining pressure was about 5 to 10 min. Typical permeability and porosity behaviors in the cyclic effective pressure tests are shown in Figure 3. Both permeability and porosity decreased with increasing effective pressure, and the rate of decrease in permeability slowed as effective pressure increased. Permeability did not change very much during decompression, and it did not recover its initial value even at the lowest effective pressure. This result suggests that, in terms of permeability, the specimens showed elastic–plastic behavior in that permeability was influenced by the effective pressure history of the specimen. The porosity-pressure curve showed elastic–plastic behavior of the specimens as well, similar to the permeability (Figure 3b), but the recovery rate of porosity during decompression was faster than that of permeability. Such elastic–plastic behavior is generally observed in soft clays and soil materials (Wood 2002). Examples of cyclic effective pressure tests of (a) permeability and (b) porosity. (c) Examples of fitting curves of effective pressure versus permeability for the experimental results. R2 is the correlation coefficient. Data from compression curves (show in Figure 3a) were plotted. Initial permeabilities of the core samples at the lowest effective pressure (about 1 MPa) ranged from 3 × 10−16 to 2 × 10−17 m2, and in almost all samples, permeabilities decreased by two orders of magnitude at 40 MPa of effective pressure (Figure 4a). The rate of reduction of permeability was similar in all samples. Mudstone from 390.00 mbsf in C0004D showed the largest permeability (C4D–4, 2 × 10−17 m2 at 10 MPa of effective pressure) among the tested samples, and fault breccia from 226.26 mbsf in C0004D showed the smallest (C4D–1, 9 × 10−19 m2 at 10 MPa). The permeability curves of most samples during pressurization could be represented by the power function k w = a · Pe b , which is a model that was introduced by Gale (1982), or the exponential function k w = a · exp(−B · Pe), where k w is the permeability, a and b are constants, and Pe is the effective pressure (Table 1). Permeability (a), porosity (b), and specific storage (c) as a function of effective pressure. Specific storage was determined from the porosity data shown in Figure 3b by using Equations 2 and 3. Laboratory data from compression curves were plotted. CSF is the core depth below seafloor (m). The initial porosity of the specimens at the lowest effective pressure varied considerably between 31% and 45% (Figure 4b). Porosity declined by 2.5% to 3.7% at 40 MPa from the initial porosity. The largest reduction in porosity was found in the fault breccia in core sample C4D–1. Logarithmic (k w = a − b · log(Pe)) or exponential functions fitted the porosity-effective pressure curves well (Table 1). Initial specific storage values were between 3 × 10−9 and 1 × 10−9 Pa−1, and these decreased with increasing effective pressure (Figure 4c). A rapid reduction of specific storage was observed by 10 MPa of effective pressure, after which it increased again in several samples. where Φ0 is the initial porosity at 0 mbsf (z = 0) and α is the compaction constant. Equation 5 fitted the porosity-depth data at site C0004 well, which were measured on board using discrete samples and a helium gas pycnometer (Figure 2d; Kimura et al. 2008) where the parameter values Φ0 = 65% and α = 0.00125 were chosen. We selected Φ0 = 50% and α = 0.0006 to reproduce the porosity-depth curve at site C0007 in an approximate manner (Figure 2h). We assumed constant ρr = 2,650 kg m−3 and constant ρf = 1,000 kg m−3 in Equation 4. In hole C0004D below 200 mbsf, the permeability seemed to increase a little with depth, and permeability in the fault zone was 7.6 × 10−18 m2 (Figure 2a). In situ specific storage was calculated from the porosity-effective pressure curve in our laboratory tests. Hydraulic diffusivity, which was calculated as k w /ηS s and equaled 9.3 × 10−7 m2 s−1 in the fault zone, displayed the lowest value in C0004D (Figure 2c). The relative change in permeability in C0004D is similar to the permeability trend reported by Ikari et al. (2009) using core samples, although our permeability values are two orders of magnitude larger than theirs. In hole C0007D, the permeability and hydraulic diffusivity slowly decreased with depth (Figure 2e,g). Permeability and hydraulic diffusivity were both lowest at 429.54 m in fault zone 3, which is very near to the depth of the slip localization layer. Permeability and hydraulic diffusivity were lower in the shallow megasplay fault zone than in the frontal thrust fault zone 3 (8.7 × 10−18 m2), but the difference was very small. Hydraulic diffusivity in both fault zones was around 10−6 m2 s−1; this value might be small enough to cause thermal pressurization (Mizoguchi et al. 2007), which is a dynamic fault-weakening mechanism. However, transport properties will evolve by rapid shear deformation, which can drastically change the permeability of fault rocks (Tanikawa et al. 2010). Tanikawa et al. (2012) performed shear-induced permeability tests at a high-velocity condition on simulated fault gouge samples from core materials taken from the megathrust fault and the frontal thrust. Permeability values in both gouges were reduced by about an order of magnitude after the friction test. Therefore, shear-induced changes in transport properties must facilitate dynamic fault weakening induced by thermal pressurization. Ikari et al. (2009) measured the permeability of simulated gouges after shearing using a true triaxial testing machine. The gouge sample was made from the core blocks that were disaggregated and sieved to small grains. Therefore, the large difference between our permeability data and that of Ikari et al. (2009) can probably be explained by the shear-induced compaction of gouge samples and by the relative smaller permeability for disaggregated gouge samples than that of intact samples (Tanikawa et al. 2012). Permeability at site C0007 decreased with depth (Figure 2e), although the permeability variation is quite small if permeability is plotted at the same effective pressure of 5 MPa (Figure 5). This suggests that permeability reduction with depth is mainly explained by mechanical compaction with an increase in the effective pressure. 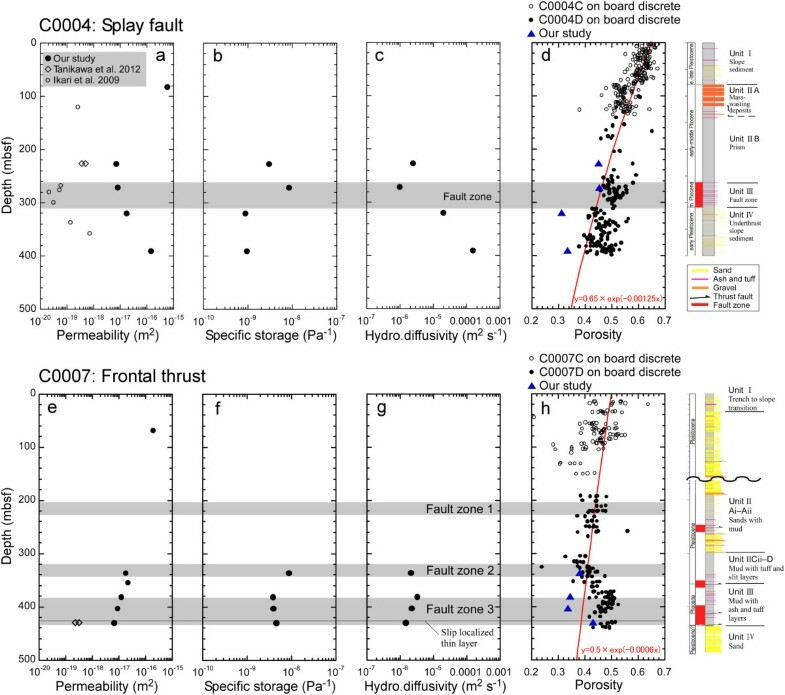 Permeability variations at site C0004 and at site C0019 of The Japan Trench Fast Drilling Project (JFAST, IODP Expedition 343/343 T) (Tanikawa et al. 2013) are larger than that at site C0007. The permeability variations observed in the JFAST sites were explained by the proportion of clay minerals, whereby the higher abundance of clay in the plate boundary fault materials resulted in extremely low permeability. Therefore, permeability variation in C0004 may be explained by such variation in the mineral composition, although we need to analyze the mineral compositions in the samples to confirm our interpretation. 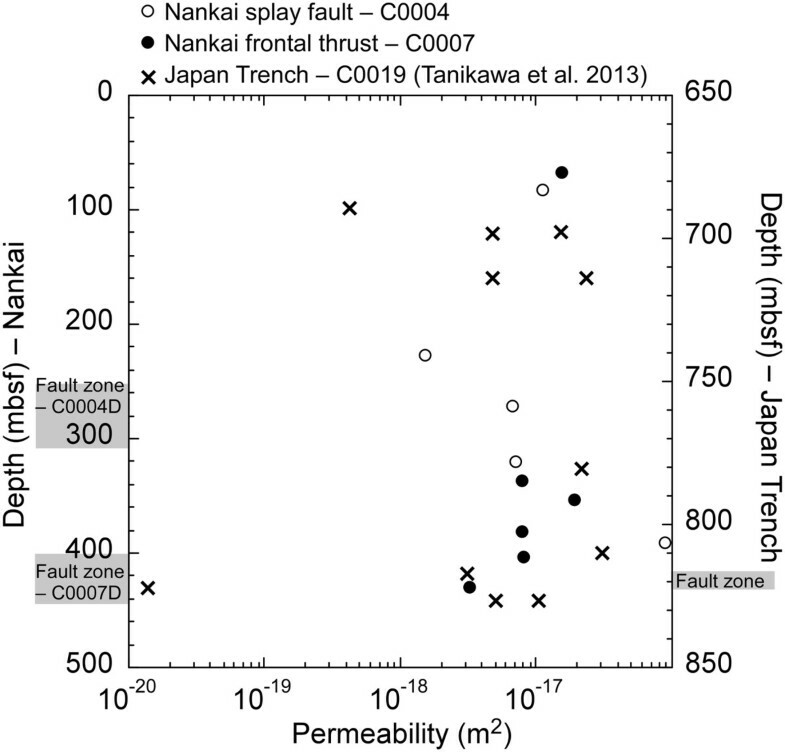 Permeability distribution at shallow depths in the Nankai and the Japan Trench subduction zones. Permeability at 5 MPa of effective pressure is plotted. We did not measure the permeability of fault rock at the Nankai Trough subduction zone because of the rarity of samples. As total clay contents and smectite content in the Nankai frontal thrust are lower than those in the Japan Trench plate boundary fault (Ujiie et al. 2013), we expect that the permeability of the Nankai Trough faults is larger than that of the Japan Trench. The lower friction coefficient in the Japan Trench décollement material than that in the material from the Nankai Trough (Ujiie et al. 2013) will be probably explained by the difference in permeability, as well as in the proportion of weak clay minerals. Sample size probably influences the permeability as well. A number of reports show the permeability for very small samples with thicknesses from 0.5 to 20 mm (Lenormand and Fonta 2007; Lenormand et al. 2010), and we used similar small samples for the transport property measurements. However, our results suggest that permeability is independent of sample length and shape (see Additional file 1). Ma and Morrow (1996) reported that several effects of sample size on permeability will be avoided if the sample length is greater than 10 grain particle diameters; our sample size was large enough to satisfy this condition. Hydraulic diffusivity was also lower in the Nankai megasplay fault zone than that in the surrounding host rock samples, which suggests that the fault zone can act as a barrier to fluid flow so that tectonic loading and fluid influx from the deep crust might cause the pore pressure to become relatively elevated within the fault zone. However, the difference in permeability between the fault zone and the host rocks of the frontal thrust was very small. We measured the transport properties of mudstone and fault breccia of mudstone origin, but the transport properties of sandstone and ash layers, which were observed throughout site C0007, were not measured. These rocks probably are permeable. In addition, the fracture permeability and its scaling effect on fluid transport properties have not been investigated yet. Therefore, we are not certain whether fluid flows preferentially within the fault zone in the frontal thrust region or whether it functions as a barrier. Variation in the fluid transport properties of a fault zone causes heterogeneity in the pore pressure distribution and fault strength, which influence future fault rupture paths in a fault system such as the Nankai branching fault system. The reduction rates of porosity in Nankai sediments (2.5% to 4% at 40 MPa from the initial porosity) seem quite small compared to those in Japan Trench sediments (9% to 15%; Tanikawa et al. 2013), even though the reduction rates of permeability between the two sites were similar. The porosity tests in this study were performed under dry conditions, although the porosity of sediments in the Japan Trench was measured under water-saturated conditions. Wetting may enhance consolidation of sediment by mechanical collapse and grain rearrangement; this is because the shear strength of sediment particles is generally weaker when wet than when dry. Permeability measured by using nitrogen gas as a pore fluid was larger than water permeability by more than one order of magnitude (Figure 6). The difference between gas permeability and water permeability was not explained by the Klinkenberg effect (Figure 6; e.g., Tanikawa and Shimamoto 2009), even though pore pressure dependence on the gas permeability, which is known as the Klinkenberg effect, was clearly observed in our gas permeability tests. The difference was probably caused by the wetting-enhanced compaction. Therefore, we might have overestimated porosity (or underestimated the porosity reduction) and specific storage. Permeability against porosity can be plotted by combining independent permeability tests with porosity tests for specimens from the same core block. The relationship was expressed by the power law function (Table 1), although the power law exponent was extremely larger than that in previous studies (e.g., exponent = 3 for the cubic law). This unrealistic relationship might have caused an overestimation of the porosity. Permeability curves for the core sample from C7D–2. 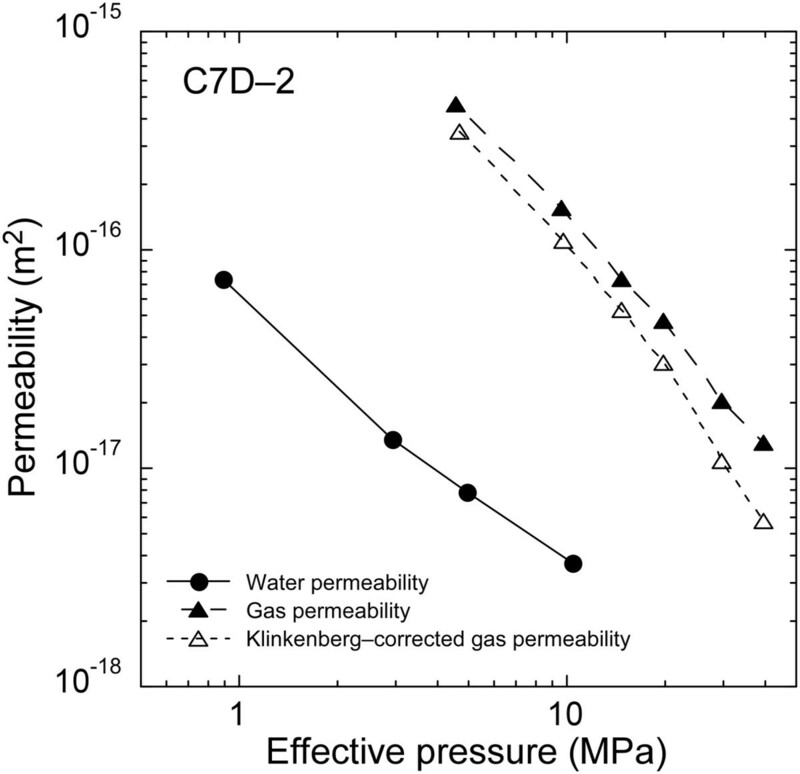 Comparison of water permeability, gas permeability estimated by using the Klinkenberg equation, and gas permeability. This research used core samples provided by the Integrated Ocean Drilling Program (IODP). The authors gratefully acknowledge support provided by the D/V Chikyu drilling crew and staff. This study was supported by two grants from the Japan Society for the Promotion of Science (JSPS) Grant-in-Aid for Science Research program (Nos. 25800284 and 21107004). We also thank the guest and chief editors and two anonymous reviewers for improving our paper. WT contributed to data collection, interpretation, and manuscript preparation. HM carried out the laboratory tests. WL, TH, and AT contributed to sampling from IODP core samples. All authors read and approved the final manuscript.